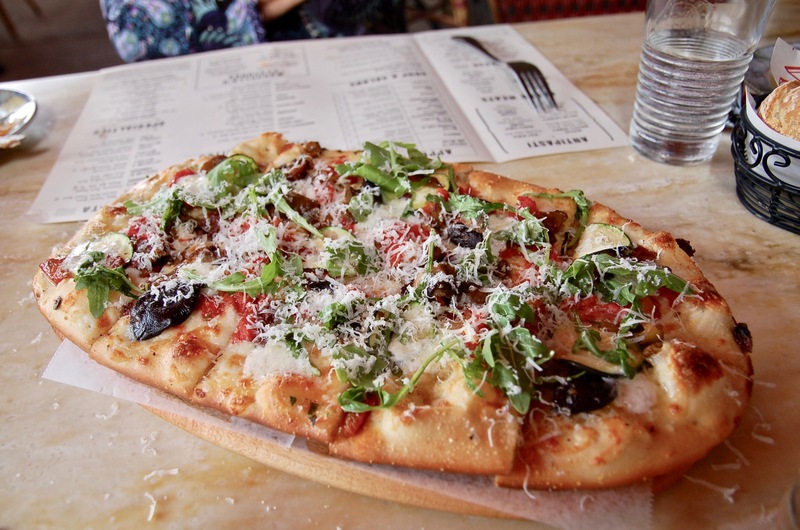 Worry not my friends, I have an answer to your Friday night feasting desires… Marcella’s Restorante, Pizzeria and Wine Bar. I know what you’re thinking… “Purtroppo so soltanto un po’ di italiano!” Don’t worry about it. The staff at this dimly lit dwelling are about as friendly as the Italian woman it is named after. 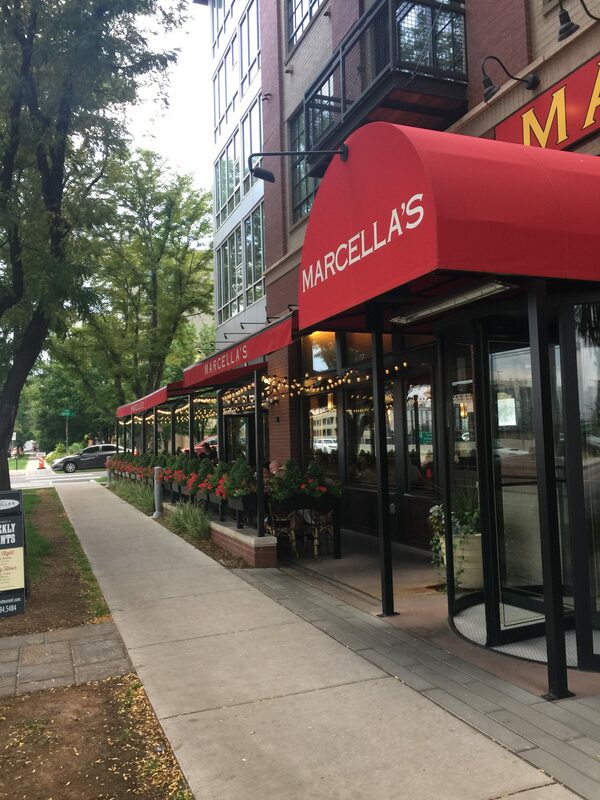 Marcella’s amazing culinary creations were swept up by the well known Cameron Mitchell of Cameron Mitchell Restaurants and shared first in Columbus, OH and then graced us with it’s presence right in the heart of Denver, CO. Standing as a replica to the infamous scene in Lady and the Tramp, this place is the perfect date night spot. Its luxurious patio stretches across the entire front of the restaurant and is lit up by strands of white lights. It certainly sets the scene for a romantic evening but is also a spacious spot for big groups or a family night out. Upon visiting, we did what I would recommend you do, and find a spot on the patio. It was a hot one and nothing sounded better than a cold drink to quench our thirst. Yes, of course they have happy hour you cocktail queen! It is at 4:00 p.m. to 6:30 p.m., Monday through Friday. They even have a late night happy hour from 10:00 p.m. to 12:00 a.m. Friday and Saturday (if you feel like closing the place down). We decided to partake in a cocktail tasting and tried several different creations. The Grapefruit Basil Fizz was our favorite, made with Finlandia grapefruit vodka, Italian basil and fresh squeezed lemon. This was perfect for the patio. Another refreshing drink was the Tuscan Limonata which featured house-made lemoncello, citrus vodka, fresh squeezed lemon and Peroni. It turns out, beer and lemoncello go together quite nicely! I never would have guessed that, but then again, that is why I drink the cocktails instead of making them. The second round included Red Sangria and the classic Aperol Spritz made with prosecco, St. Germain and Aperol. You can never go wrong with the classics. Each refreshment left me so content, I can see a not-so-distant-future visit to just the bar. Don’t fret! There was also food involved. We started out with some delectable appetizers. Some of which I would recommend as a meal if dining alone. The Braised Veal Meatball. What can I say about it, aside from the fact it was absolutely mouthwatering. To be honest, I don’t usually eat veal, but I didn’t want to be rude to Marcella, so I tried it. I truly forget about any moral hesitations I had and fell deeply in love with the moist and saucy meat I was spooning onto my plate. 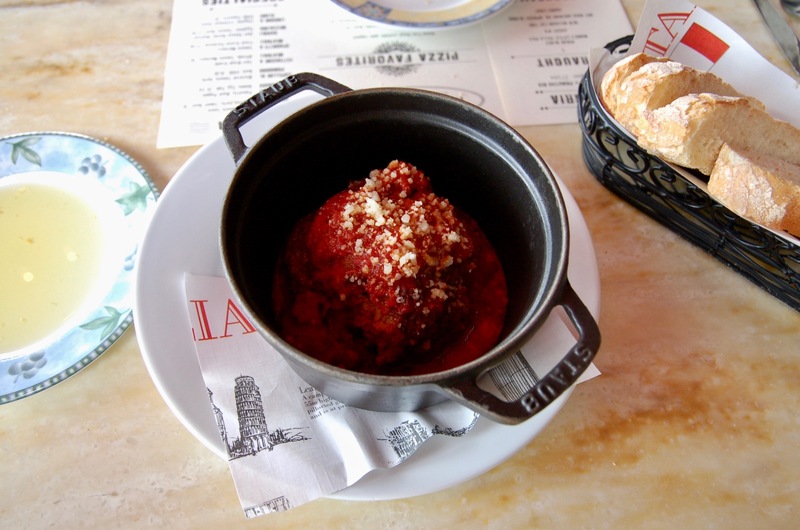 Friends… whatever you do…get the meatball! We did stretch ourselves into another inning: The Main Course. The Carbonara was out of this world. 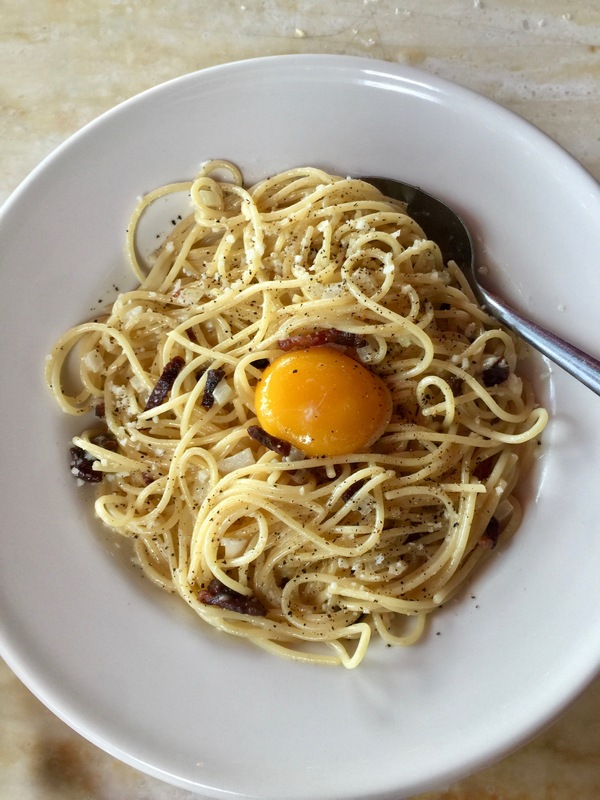 Noodles al dente tossed with pancetta, black pepper, finely diced onion and topped with an egg yolk. That first creamy bite sent me into a spin. The Pork Osso Buco was a perfectly cooked pork shank, literally falling off the bone into a moat of polenta covered in gremolata, brussel shavings and carrots. It was the epitome of Italian comfort food and reminded me of a a hearty homemade pot roast. Everything was phenomenal. The atmosphere, the size of our bellies upon finishing… but that is just it… we didn’t stop there! As any well mannered Italian (or American wannabe Italian) does, you say “grazie” when dessert comes! 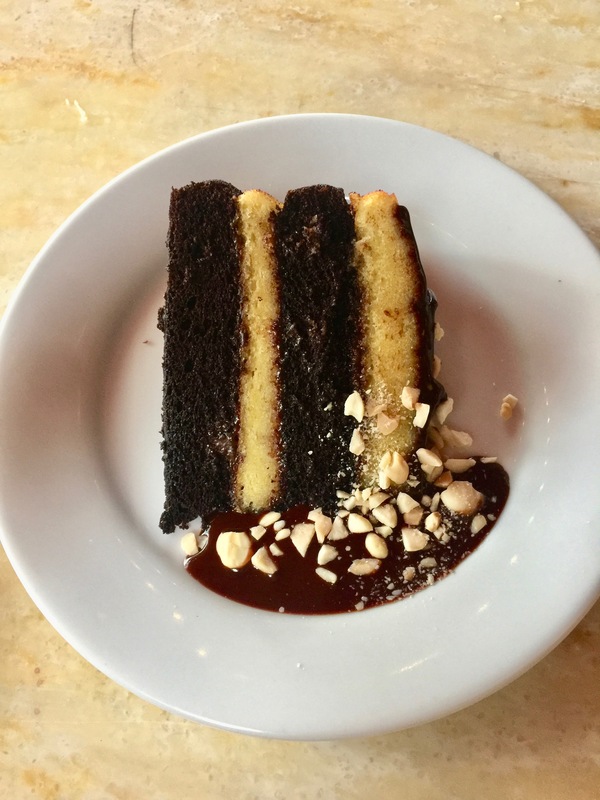 The Chocolate Almond Cake (topped with almonds and warm chocolate ganache) made for an enchanting end to our evening. 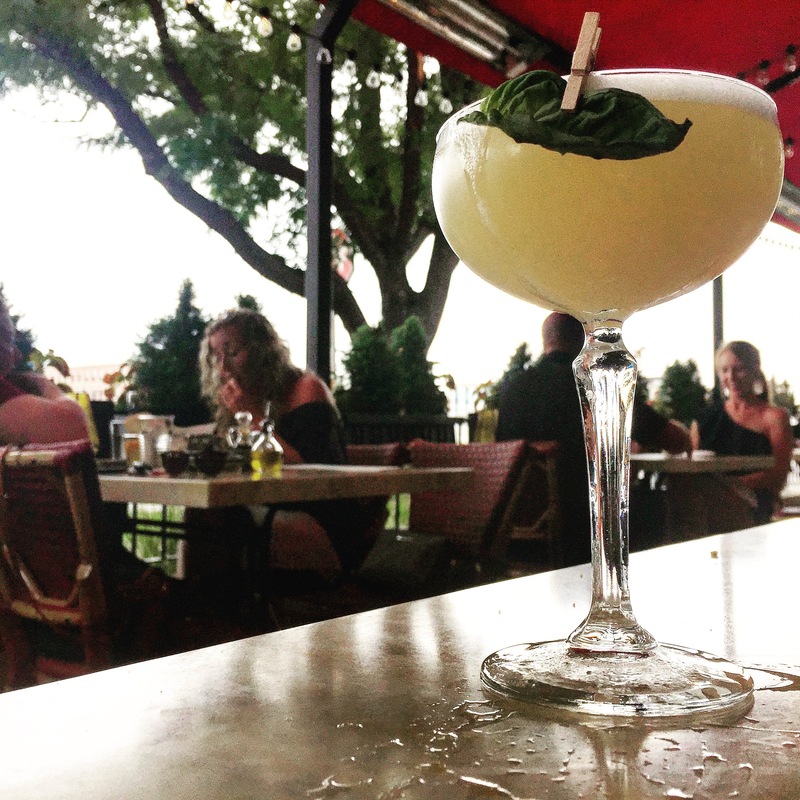 We can’t wait to come back and enjoy another evening on the patio, sipping on marvelous cocktail creations and indulging in our favorite carb-centric dishes. If you’re looking for Italian that will hit the spot, or just a cool place in LoHi, this is the place to be. Sei il migliore Marcella’s….until next time.